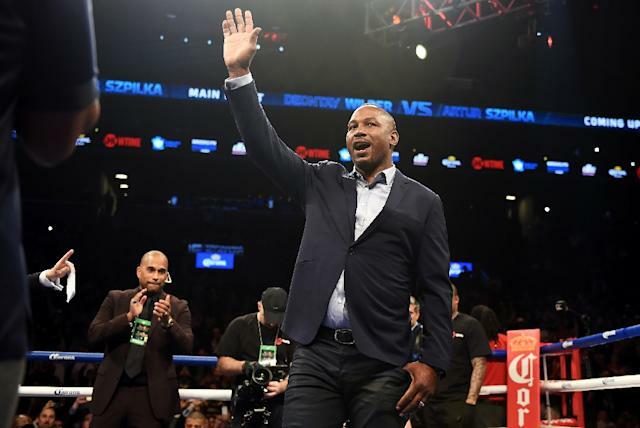 Los Angeles (AFP) - Boxing hall of famer Lennox Lewis won't be spending his money on the Floyd Mayweather-Conor McGregor fight, saying he "can't take it serious" because the outcome is too predictable. The former undisputed world heavyweight champion said the combination of Mayweather's boxing experience and hand speed will be too much to handle for McGregor, who has made him name as a mixed martial arts fighter. "It's ridiculous to me," Lewis told US sports broadcaster ESPN. "You are talking about one discipline where you can use only your hands and only a few can do it. "Every battle sport always starts with your hands, but they are two totally different sports." The fight is being held in the T-Mobile Arena in Las Vegas and promoters are hoping to make millions off the pay-per-view sales. Scheduled as a 12-round boxing match with 10 ounce gloves, three-time world heavyweight champion Lewis says it won't go the distance. "I can't take it serious," Lewis said. "Mayweather is the best in his weight class, no one can touch him in boxing. "Floyd will stop him. He's just too good at boxing for McGregor and McGregor is just too inexperienced. "I wouldn't buy it -- but I would be interested in the result. To me, I know who is going to win already so there's no use in watching it." Lewis, who fought for Canada at the 1984 Los Angeles Olympics, joins a growing list of boxing purists who have come out against the much-discussed fight which will take place August 26. The 40-year-old Mayweather has been retired since beating Andre Berto in September 2015 and improving his career record to 49-0. The matchup with McGregor gives Mayweather a chance to reach the 50-0 career milestone. Former champ Oscar De La Hoya and promoter Kathy Duva have also slammed the event as an exhibition spectacle, pointing to the fact that the 28-year-old McGregor has never had a professional boxing match and only dabbled in the sport as a teenager. But unlike those two, Lewis doesn't feel the novelty matchup will hurt boxing's image. "I don't believe it would damage boxing .... I love Bruce Lee and the other disciplines and when he fought against other fighters, you wanted to see the differences, so I can see the appeal," Lewis said. Mayweather-McGregor have yet to get together face-to-face since the announcement but they are expected to announce a promotional tour that will take them to a couple of major US cities.